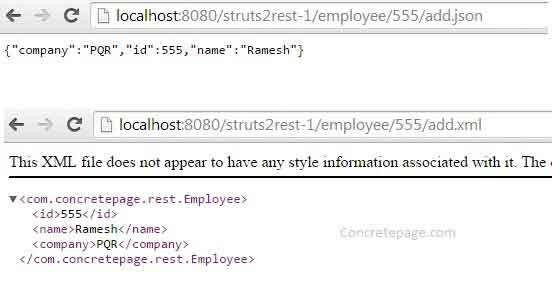 This page will provide the Struts 2 and REST web service integration example. 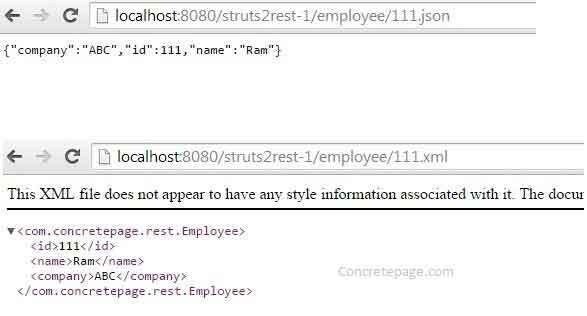 Struts 2 provide REST plugin to implement REST web service. Parent package should be rest-default. Conventionally action class name is written with Controller suffix. Struts 2 REST web service supports different content-type response. To get response as JSON, use json extension and to get XML response, use xml extension. In the example we have an employee repository REST web service. For the given employee id in REST URL, employee profile is retuned by the application. To run the example, we need below software. 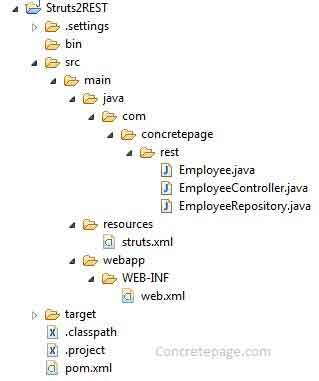 Find the project structure in eclipse for struts 2 and REST web service integration. To support struts 2 rest plugin, we need to resolve dependency for struts 2 convention plugin. Find the struts.xml in which struts convention plugin is configured. Find the description for the convention plugin being used. <constant name="struts.convention.action.suffix" value="Controller"/>: Defines a suffix for action class. Conventionally action class for REST web service has Controller suffix and this suffix will not be included in URL. <constant name="struts.convention.action.mapAllMatches" value="true"/>: mapAllMatches can be true or false. <constant name="struts.convention.default.parent.package" value="rest-default"/>: To support REST web service, struts 2 uses rest-default as parent package. <constant name="struts.convention.package.locators" value="rest"/>: Locator is the last word of the package within which controller action class resides. In our class, it is rest. For the demo application, we are creating an employee repository. First find the employee class. Now find the repository class with some sample data. Find the controller class. The class will extend ModelDriven and need to override getModel () method. Whenever a REST URL is hit, this is the method which returns response. 1. URL for index(): The REST web service URL can be as below for the index() method. Look at the URL. employee has been taken from EmployeeController class. Suffix is ignored. The default method is index(). To fetch JSON response, use json extension and to fetch xml response, use xml extension. 2. URL for id: Now find other URLs for id setter and getter. To pass any input value, there must an id property and we need to create setter and getter method for the id. 3. URL for add(): To call our own method, create a method like add(). This method will be called after id setter and getter. The value 555 in the URL will be assigned to id. The URL will be as below. This url will call add() method and return data assigned to model. Find the web.xml for struts 2. Now we are done. Happy Learning.